JJ is the internationally known author of 4 bestselling diet and health cookbooks. Working with Hollywood A-listers and everyday people alike she has built a blockbuster health and wellness empire on stamina, intuition, and determination. But it wasn’t until 2012 as she stood by her dying son while the doctors told her to “let him go” that she realized how powerful those traits were and that from that moment on every decision she made, minute-by-minute, was all or nothing. In this riveting – and incredibly personal – account, JJ opens her heart to her readers and shares the story of her sixteen-year-old son who was left for dead by a hit-and-run driver and how, consumed by rage and hopelessness, she made the decision to trust her heart, defy the odds, choose forgiveness, and fight for his life. She ran her business from his bedside while tirelessly nursing him back to health and into the thriving young man he is today. 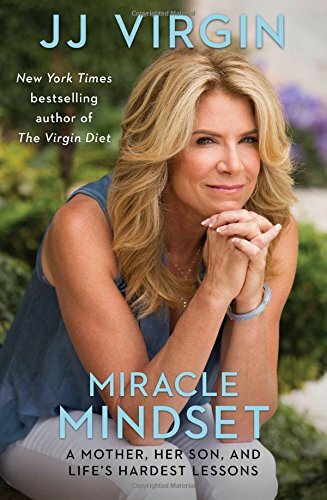 More than page-turning memoir with a happy ending, MIRACLE MINDSET is JJ’s guide to the invaluable lessons she learned, how her life changed to become an advocate for those living with a brain injury, and how her readers can also overcome the seemingly impossible. 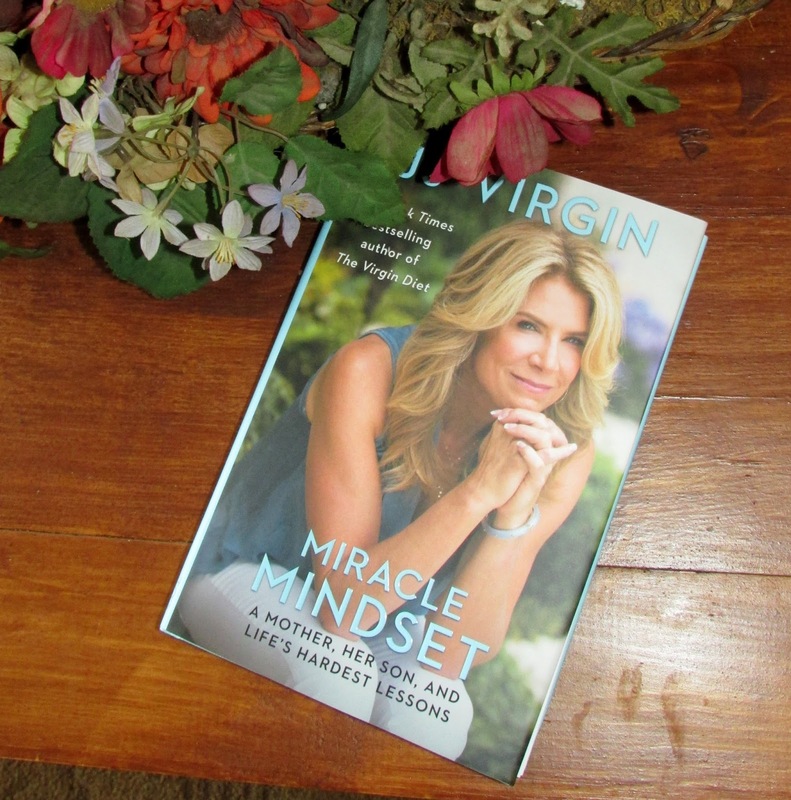 Her “Miracle Mindset” transformation is based on the lessons she learned along the way such as: Don’t Wish It Were Easier—Make Yourself Stronger, Little Hinges Swing Big Doors, and Forgiveness Will Set You Free. I'll be honest and admit I had no idea who JJ Virgin was until receiving her book, MIRACLE MINDSET. I can't even begin to imagine what I'd do if I went through the same life circumstances she was presented with. JJ is definitely a trooper, and it shows in her book. MIRACLE MINDSET tells of the journey the author went through for a long time in rebuilding her life after her son's accident that changed the course for several people. The emotions are high, raw, and real. JJ tells it like it is, and shares what she's learned throughout it all. She's an inspiration of how to stay strong in difficult times. There are seven key lessons she teaches throughout the book, which are informative and insightful. My favorites were the focus on forgiveness and making yourself stronger. I personally believe that having faith in God and relying on Him is a big part of making your life better and receiving miracles. Although that wasn't addressed in this book, I feel it was generally very helpful. And, the story of how the son, Grant, perseveres is inspiring. One person will win a book copy of MIRACLE MINDSET: A Mother, Her Son, and Life’s Hardest Lessons. I have not heard of JJ Virgin. I am intrigued by her book and look forward to reading it. I have heard of JJ Virgin. I have seen some of her shows on PBS about diet and food. I am impressed with what you wrote as the synopsis. I haven't heard of her before. In a way it's funny, I used to work with some people overseas and my username back then was JerseyJanice and everyone called me JJ. Back to the book, I have written a book free on the blog called Help Stop The Pain - I released it 6 months after I lost my 22 year old daughter to suicide. It's very painful and I have been working this year (and making some progress) of making it a little more helpful, mixed in with the pain - to offer some hope to others. I usually opt for Kindle books, but I may just make this one an exception and keep it as hardcover. This one may do me some good. Some days, I find, I really tend to spend more time in the fog just so that I can get through the day. I've never heard of this author before. I have never heard of this author. I have never heard of this author of this book. I have never heard of her, however, this sounds like a good book. I have not heard of JJ Virgin prior to your post. I have not heard of her. U have not heard of JJ Virgin. I have never heard of the author JJ Virgin before. have not heard of her but from the article, I would like to read her book. I haven't heard of her before, but I believe that it would be inspirational for me to read this book. i have learned going through hard times myself that i have to accept the difficult times and do my best in the storm and trust God to take care of me. I have never heard of the author before, but I am interested in learning more. No, I have never heard of her before. Yes, I have my friend mentioned her to me. I have never heard of her. No I've never heard of the author before. The name J.J. Virgin sounds very familiar, but I read so many books, I am not sure if I have read anything by her. My 92 year old mom keeps a list of books and the authors' names that she reads each year. She is much more organized than me. The book detailed for this giveaway sounds amazing and I can't wait to read it. The author sounds like a phenomenal and strong-willed woman. I am not familiar with the JJ Virgin nutrition guide. I have not read any JJ Virgin books or other information. I don't know about the JJ Virgin publications on nutrition. I would love to use the nutrition information associated with JJ Virgin. I would like to try the JJ Virgin diet and follow the meal assembly guide. I believe JJ Virgin has an excellent background in nutrition and exercise.